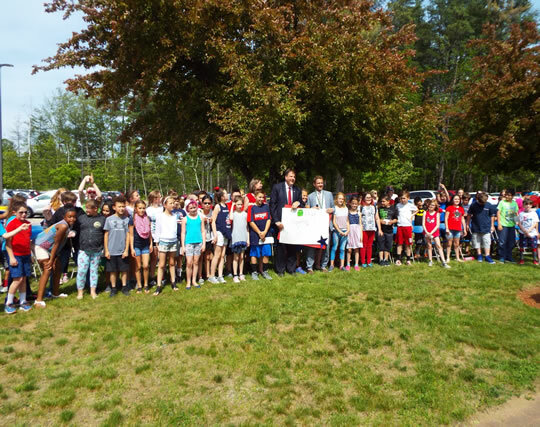 Governor Chris Sununu paid a visit to Lamprey River Elementary School fourth graders on Friday afternoon, May 25, as part of the school’s government study unit – and to make up for his missing a chance to chat with some of the students when they took part in the annual fourth grade trip to the State House in Concord. 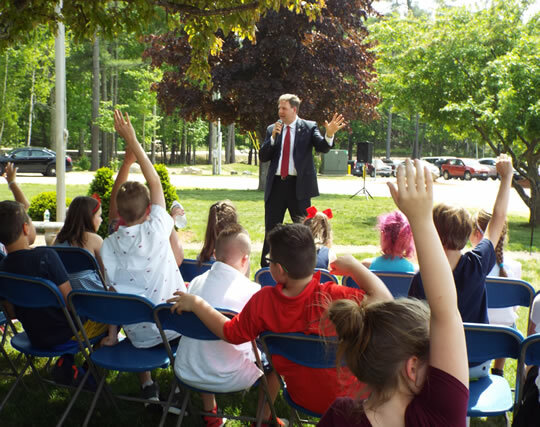 The sun was shining and there was just enough of a breeze to keep the black flies and mosquitoes away while the more than 100 fourth graders gathered outside to talk with the Governor. Sununu gave a quick overview of the year, saying about 1,000 bills were submitted but only about 200 passed. He asked if the students knew what he did with the bills, and many of them did, saying he could either sign or veto them. Sununu said he had to sign a group of bills that day but vetoed one that he said increased costs. Then he took questions from the students – many of them humorous but others surprising coming “out of the mouths of babes,” as one adult onlooker said. •If you could change one thing in Raymond, what would it be? He asked the kids what it would be and they all said “the school.” He responded that he had $30 million in Safe School grants and hoped that the Principal had applied for some of that money. Principal Bryan Belanger said he has done so. 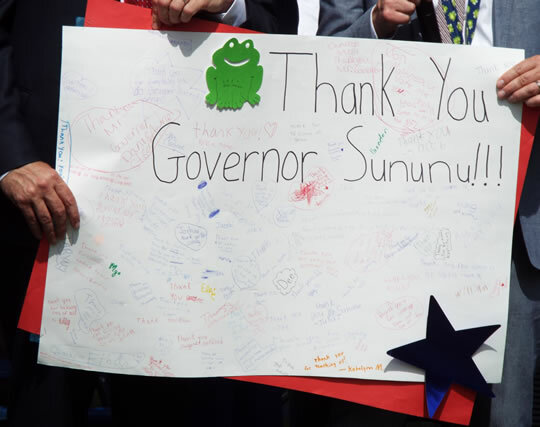 As the event drew to a close, a group of students and Belanger gave Governor Sununu a poster board-sized Thank You card, signed by all of the fourth graders . 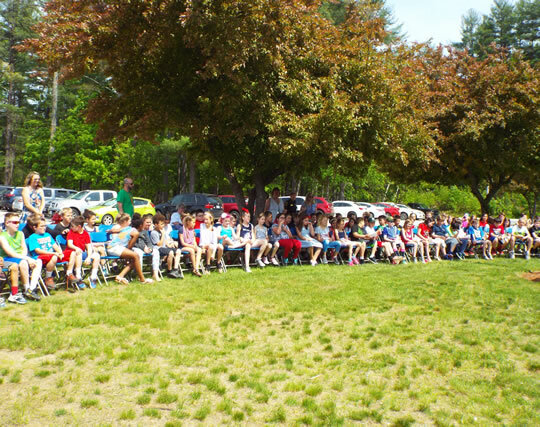 Fourth grade teacher Jen Saltmarsh coordinated the event for the school’s five fourth grades. 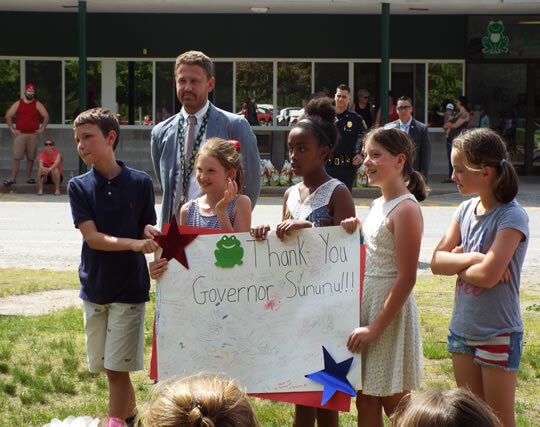 Saltmarsh explained that as part of the school’s fourth-grade study unit on government, students learn about the three branches of government, both nationally and on the state level, and how a bill comes about. 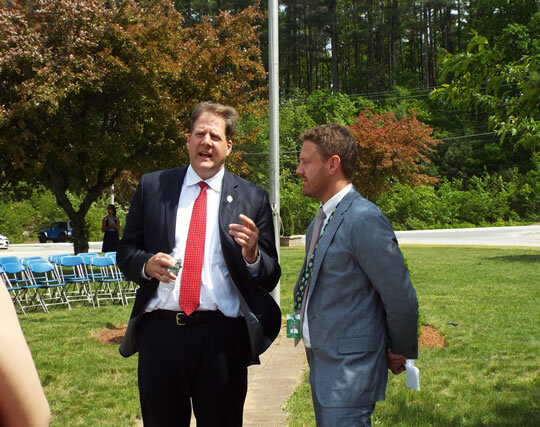 They also travel to the State House in Concord – this year the trip was on May 8 – and visit the Hall of Flags, the House of Representatives, the Senate and the Governor’s office. During this year’s visit, students were able to chat with two of Raymond’s three state representatives – Kathleen Hoelzel and Carolyn Matthews. The Town’s third representative, Michael Costable, and State Senator John Reagan were not in attendance. 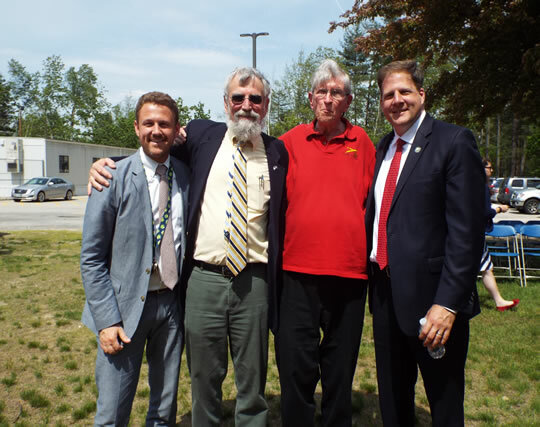 The students were divided into two groups for their tour, and while the first group met with Governor Sununu, he had an unexpected commitment that kept him from visiting with the second group. Saltmarsh said students in the second group were understandably disappointed, but luck was on their side - a parent contacted the Governor’s wife and asked if he could make the trip to Raymond to meet the youngsters, and he agreed to do so. 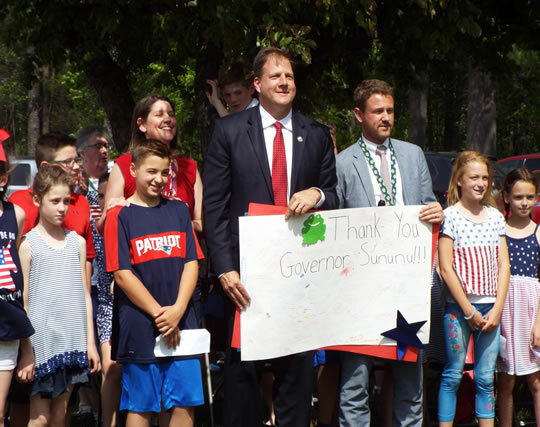 4th graders with Governor Sununu holding his Thank You poster.